Whether you want to buy stocks, real estate, or pay down debt, here are five of the best ways you could invest your money in 2017. If you have some extra money to put to work, but don't quite know what to invest in, there's good news. The best investment ideas for 2017 include: Paying off your credit cards, buying real estate, high-quality dividend investments, and banking stocks. Here are the best ways to approach each of those. I listed this one first for a reason, even though it technically isn't an "investment." Simply put, it doesn't make sense to buy stocks or any other type of investment if you have high-interest credit card debt. The reason is simple mathematics. If you have $5,000 in credit card debt at 18% interest, you're paying $900 per year just for the privilege of owing that money. When investing, the best you can reasonably hope to earn on a consistent basis is 10-12% returns per year. Even at the top end of that range, you can reasonably expect a $5,000 investment to return $600 in its first year, at most. In other words, by investing instead of paying credit card debt, you're setting yourself up to lose money. The current bull market is the second-longest in history, and while that doesn't necessarily mean that stocks are going to fall, at some point, we're going to see a correction or even a full-blown recession -- it's just a matter of when. For this reason, I'm a fan of adding some defensive investments to your portfolio in 2017. And contrary to popular myths, being defensive doesn't mean avoiding stocks. One example would be to buy an index fund that invests in dividend growth stocks, which tend to fare better during recessions. The SPDR S&P Dividend ETF (NYSEMKT:SDY), which tracks the S&P High-Yield Dividend Aristocrats Index, is one good option. Financial stocks have been the biggest beneficiaries of the Trump rally, with the sector up nearly 18% since the election, and many banks performing even better, such as Bank of America (NYSE:BAC) and JPMorgan Chase (NYSE:JPM). Even after the gains, I think we could still be in the early stages of a rally in banking. Not only are interest rates projected to rise under Trump, but he has pledged to cut burdensome regulations on banks and make it easier to do business. Also, if Trump's tax cuts, infrastructure spending, and other initiatives create the kind of job and wage growth he claims they will, the banks could have more lending demand as well as higher deposit bases. 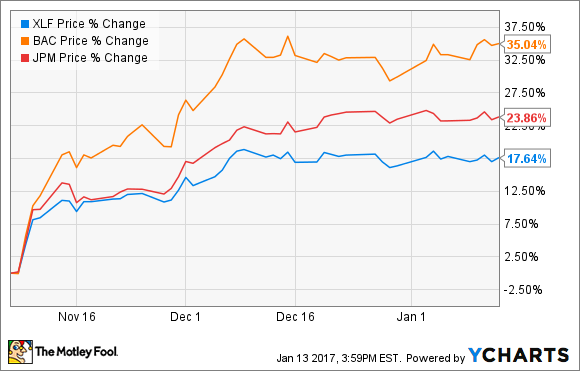 The Financial Select Sector SPDR ETF (NYSEMKT:XLF) is a good way to invest in the entire sector, and if you want to buy an individual stock, Bank of America is one of my favorites -- and my single largest stock holding -- as we head into 2017. 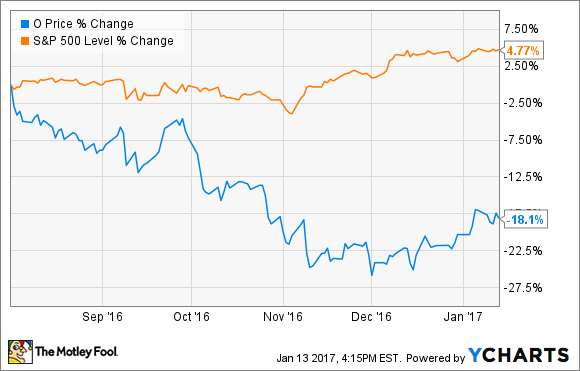 As I wrote after the bank reported earnings, even though the stock is up tremendously, Bank of America is actually increasing its buybacks for the first half of 2017, indicating that management feels that shares are still a compelling value. While much of the market was hitting record highs in 2016, the real estate sector was a big underperformer. Since equity REITs can be some of the best long-term dividend growth investments in the market, now is a good time to scoop up some of these on sale. One REIT in particular that I'm a big fan of is Realty Income (NYSE:O), which invests in freestanding retail properties, most which are occupied by businesses that are recession-resistant and not vulnerable to e-commerce competition. In addition, the company's long-term net leases add to the stability. You can read a complete description of Realty Income's business here, and now that it has fallen by 18% since mid-2016, this 4.1%-yielder looks like a good buy for long-term investors. Before I say anything else about this one, you may have heard that your home is not a good investment. And that is a true statement, in the sense that if you put $200,000 into a stock index fund, it will likely grow much higher over time than the value of your home. Stocks have historically returned 9-10% per year, as compared with around 3% for home prices. However, a home is a smart investment in other ways. For starters, it takes the money you would otherwise be paying rent with, and turns it into a form of forced saving. Even if just 20% of your initial mortgage payment is going toward the principal, you're still building up a lot more equity than you would as a renter. Second, because you generally buy a home with leverage (aka borrowed money), those 3% annual price gains can be magnified considerably. For example, if you put $50,000 down on a $250,000 home, and over the next five years its value grows to $275,000, you have a gain of $25,000 -- 50% of your initial "investment." Finally, I like buying a home as an investment for the tax benefits. To be fair, you can only take advantage of these if you itemize deductions on your tax return, and there's no telling what could happen to them during the Trump presidency, but for now, this can be a big benefit. For example, if you live in a high-cost area, being able to deduct the mortgage interest and property taxes on a $500,000 home could easily translate into a $25,000 tax deduction or more every year. You can read a more thorough discussion of why my wife and I choose to be homeowners here.